See PPE requirements and resources for UC San Diego employees. Personal protective equipment controls hazards that cannot be eliminated through engineering and administrative controls*. PPE includes all clothing and accessories designed to protect against safety and health hazards. At UC San Diego, an appropriate level of PPE must be worn at all times when hazardous material or equipment is used in a workplace. Conduct and document a workplace hazard assessment to determine PPE requirements. Provide employees with PPE and training identified by the hazard assessment. Ensure employees use and properly maintain required PPE. Use the PPE Hazard Assessment Form (English PDF) (Spanish PDF) to perform and document a workplace hazard assessment. Keep all PPE-related documentation until the hazard ends or is eliminated. Based on the hazard assessment, provide employees with required PPE. Provide employees with time and resources to be adequately fitted and trained to use assigned PPE. Confirm employees properly maintain and store their assigned PPE in safe, sanitary conditions at all times. Make sure employees demonstrate an understanding of the training topics above before performing work that requires the PPE. Retrain employees who do not demonstrate an understanding or do not exhibit an adequate skill level. Update your Hazard Assessment as hazards and personnel change, and at least once every 12 months, irrespective of changes to hazards or personnel. Identify and evaluate new equipment and processes for PPE requirements. Review accident records and reevaluate the suitability of previously selected PPE. Provide disposable PPE for visitors and service workers if necessary. Questions? Contact a General Safety specialist. 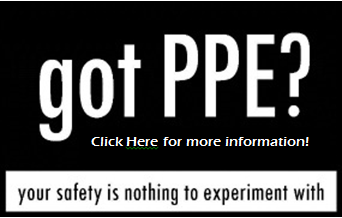 Go directly to PPE Support for Researchers to get free PPE for eligible lab members. Enforce the UC Systemwide PPE policy for minimum PPE in your lab. Minimum lab attire and PPE equipment required at all times for lab workers is full-length pants (or equivalent) and closed toe/heel shoes. Create Hazard Control Plans using the Hazard Control Plan (HCP) application to identify and assign appropriate PPE for each hazardous chemical in your lab. Each lab employee is assigned to a Hazard Control Plan that specifies PPE they are required to wear for work with the hazardous chemical. Use Laboratory Hazard Assessment Tool (LHAT) from My Research Safety to identify and assign appropriate PPE. The LHAT provides a summary report of hazards present in the lab and specifies PPE for workers. Access the Chemical Hazard Use Application from My Research Safety. Develop a Hazard Control Plan for each hazardous chemical present in your lab. Hazard Control Plans specify PPE required for work with a particular hazardous material. Assign employees on your Lab Personnel list to appropriate Hazard Control Plans. Confirm each employee acknowledges receipt of their assigned Hazard Control Plan(s). Access the Laboratory Hazard Assessment Tool from My Research Safety. Create a new hazard assessment and answer the questions to survey your lab for hazards. Once all questions are answered, the PI must review and confirm the assessment. After the assessment is confirmed, the assessment should be distributed to appropriate laboratory personnel, who will receive an email asking them to review the document and click a link to confirm their review. PPE required by the assessment will automatically be added to each assigned persons' PPE list to indicate the items are required for their research. As the person receives the items, documentation of receipt can be made in the Laboratory Hazard Assessment Tool, under the Manage Existing Hazard Assessments link. Update your Laboratory Hazard Assessment as hazards and personnel change, and at least once every 12 months, irrespective of changes to hazards or personnel. Provide employees with required PPE, based on your Hazard Control Plans and Laboratory Hazard Assessment. Get free minimum PPE for eligible lab workers from UCSD's PPE Distribution Program. Lab employees must be entered on your Lab Personnel List in UCSD's Hazard Control Plan (HCP) application to participate in the PPE Distribution Program. Ensure employees are properly fitted and trained to use their assigned PPE. Confirm employees know how to use, maintain, and store their PPE in safe, sanitary conditions. Confirm on your Hazard Control Plan Lab Personnel list that employees acknowledge receipt of their Hazard Control Plan and Laboratory Hazard Assessment assignments. Confirm employees understand the training topics above before beginning work in your lab. Retrain employees who do not demonstrate an understanding of PPE use or do not exhibit an adequate skill level. Use the PPE hazard assessment document appropriate for your work area. Update your hazard assessment as hazards and personnel change, and at least once every 12 months, irrespective of changes to hazards or personnel. PPE Hazard Assessment Form (English) (Spanish) PDF. PIs, access the Laboratory Hazard Assessment Tool (LHAT) from My Research Safety. Click Create New Hazard Assessment to begin the process or Manage Existing Hazard Assessment to review an existing one. Ask if PPE is needed to perform your assigned tasks. Demonstrate full understanding of the use and limitations of your PPE. Wear only the PPE assigned for a specific job assignment or task. Tell your supervisor if the hazards of the task change. Inspect the condition and fit of your PPE before each use. Avoid altering or compromising the effectiveness of your PPE. Clean, maintain, and store your assigned PPE in a ready-to-use and sanitary condition at all times. Use university-issued PPE only for university job functions and tasks. Ensure safety devices or safeguards which may include PPE are acceptable type, design, strength, and quality, and are at least equivalent to standards approved by the American National Standards Institute (ANSI). Safety Data Sheets (formerly called Material Safety Data Sheets) list appropriate and compatible safety equipment for hazardous materials. In-depth resources, such as toxicological databases, have information on chronic and acute toxicity issues. SDS Sources has links to both kinds of information. PPE does not eliminate the hazard. If personal protective equipment fails or is improperly used, exposure can occur. For reliable protection, make sure PPE is clean, in good condition, fits correctly, and is appropriate for the materials and equipment used. Understanding the purpose and limitations of PPE will help you select and use it effectively. Use protective clothing as a safeguard against hazardous material spills, splashes, intense heat, impact, cuts, infectious materials, and radiation exposures. Protective clothing includes lab coats, smocks, scrub suits, gowns, rubber or coated aprons, coveralls, uniforms, and pierce-resistant jackets and vests. For work with hazardous materials such as pesticides, herbicides, and caustic materials, wear coveralls or a uniform you can change out of after work. Minimum required PPE that must be worn at all times in a laboratory or technical area is full-length pants (or equivalent). Lab coats (or equivalent protective garments) must be worn by all personnel working with hazardous materials as determined by a hazard assessment. Flame resistant lab coats may be required when handling pyrophoric, air/water reactive materials, open flames, and certain quantities of flammable liquids. Use safety glasses for minor splash hazards, goggles for moderate hazards, and goggles combined with a face shield for severe hazards. Safety glasses - Eye protection is indicated for flying particles, acids or caustic liquids, welding, light that could injure eyes (lasers, ultraviolet, infrared, radiation), and infectious body fluids. Adequate eye protection requires the use of hardened glass or plastic safety spectacles with side shields. Safety glasses used in the laboratory must comply with the Standard for Occupational and Educational Eye and Face Protection (Z87.1) established by the American National Standards Institute (ANSI). Side shields on safety glasses offer some protection from objects approaching from the side but do not provide adequate splash protection. Wear chemical splash goggles or full-face shields when significant liquid splash hazards exist. Goggles - Goggles provide a tighter face seal than safety glasses, and are not for general laboratory use. Wear them when there is a hazard from splashing chemicals or flying particles. For example, wear goggles when using glassware under reduced or elevated pressure, or using glass apparatus in combustion or other high-temperature operations. Impact-protection goggles have perforated sides to provide ventilation and reduce fogging of the lens but do not offer full protection against chemical splashes. Use chemical goggles with splash-proof sides for protection from harmful chemical splash. There are also specific goggles and masks for glassblowing and intense light sources such as welding or lasers. Face shields - Goggles or safety glasses alone do not meet ANSI standards for face and neck protection. For greater protection from flying particles and harmful liquids, wear a face shield to protect the face and throat—critical if your work puts you at risk of hazardous material splashes or flying debris from possible explosions. For full protection, wear a pair of safety glasses or goggles (depending on the hazard) in combination with a face shield. Consider using a face shield or mask when operating a vacuum system (which may implode), or conducting a reaction with explosive potential. Always use a UV-blocking face shield when working with transilluminators or other devices that produce ultraviolet radiation. Minimum required PPE that must be worn at all times in a laboratory or technical area is closed toe/heel shoes to protect feet from chemical spills and sharp objects. Wear proper protective gloves for potential contact with corrosive or toxic materials, materials of unknown toxicity, sharp-edged objects, and very hot or cold materials. Select gloves based on the material handled, the particular hazard involved, and their suitability for the operation conducted. Not every glove is good for every application. Perform a risk assessment BEFORE making your selection. Common glove materials include neoprene, polyvinyl chloride, nitrile, butyl, and natural rubbers (latex). These materials differ in their resistance to various substances. Chemicals eventually permeate all glove materials. However, gloves are safe for limited periods if one knows the specific use and glove characteristics (such as thickness and permeation rate and time). Use disposable surgical-type gloves for incidental contact. Consider double gloving (the wearing of 2 gloves on each hand) when handling highly toxic or carcinogenic materials. Use heavy-duty gloves for non-incidental contact and gross contamination. Wear sturdier gloves such as leather for handling broken glassware, inserting glass tubes into rubber stoppers, and similar operations where you do not need protection from chemicals. Use insulated gloves when working at temperature extremes. Do not wear woven gloves while working with cryogens as the liquid may work its way through the glove to your hand. Use gloves specifically designed for work with cryogens. Gloves worn for working with elevated temperatures may not be appropriate for working with extremely low-temperature liquids. For work with liquid pyrophoric chemicals outside of a glove box, appropriate hand protection must include chemically resistant outer gloves (Ansell 25-201 NeoTouch® neoprene gloves) on top of an approved flame resistant (FR) inner glove or glove liner (Ansell 70-200 Kevlar Liner gloves). If flame-resistant gloves compromise dexterity due to the nature of the work, contact the Chemical Safety Officer (858-822-1579) for guidance. Never reuse disposable gloves. Learn about glove selection and use. Head protection is indicated for moving or falling objects, the possibility of bumping heads on objects or equipment, or contacting an electrical source. Hard hats must be worn by electricians, construction workers, and any other workers when there is a danger of objects falling from above. A variety of hearing protectors, including earplugs and earmuffs, are available for employees whose workplace reaches critical noise levels. Situations, where employees are routinely exposed to elevated noise levels, must be evaluated to determine if employees must be included in UCSD's Hearing Conservation Program. Fitted (cartridge) air-filtering face masks are only used under the direction of EH&S. Work environments and processes where exposure to harmful material by inhalation is possible and cannot be prevented with engineering controls will be evaluated to determine if employees must be included in UCSD's Respiratory Protection Program. Disposable "dust masks" may be used for protection from nuisance dust. Remove all PPE before leaving your workplace. Never wear lab coats, gloves, coveralls or other potentially contaminated PPE to public locations such as cafeterias, restrooms, elevators, offices, or other off-site areas. Clean and store PPE as described in training and according to manufacturer's instructions. Always wash your hands after removing protective equipment and before leaving the work area. Have lab coats and coveralls laundered regularly by a designated vendor. See PPE Support for Researchers for free lab coat laundry service. Do not take contaminated clothing home for laundering, or to any other undesignated site. Note: Potentially contaminated PPE attire must be laundered by a laundry service that adheres to Title 8, Section 5193 of the California Code of Regulations. Your workplace should have laundry service for required safety attire. Do not take it home! Research facilities – Contact the Research Assistance Program specialist for your area. Non-lab facilities – Contact a General Safety specialist. * Engineering controls are used to remove a hazard or place a barrier between the employee and the hazard. Administrative controls are changes in work procedures with the goal of reducing the duration, frequency, and severity of exposure.